Chin Kon Yit is one of the most established watercolour artists in Malaysia. In fact, his works is so popular, and his technique so unique, Kon Yit is very much one of the few watercolour artists of Asia. In a time where contemporary art is defined and produced using acrylic and oil for visual contrast, Kon Yit sticks close to what he knows best, watercolour and has done extremely well to establish himself as the master in this technique and thereby becoming a master in this segment. It is very easy to recognize Kong Yit’s work because the images that are projected are soft with very vibrant colours used. While most artists exhibit their work at galleries and art spaces, Kon Yit goes a step further where his work are cemented and published in books which have been used as collection as well as text books by some institutions. Born in 1950, he has been actively pursuing his passion in art not only in Malaysia but abroad as well and one of his latest solo exhibition was at the Shalini Ganendra Fine Art at the ‘Gems of Heritage’ show. He has since produced a series of ‘Sketches’ books that has covered scenes of Malacca, Selangor, Perak, Kuala Lumpur and Penang. Chin Kon Yit is known as the Watercolour Maestro of Asia for many reasons most notably because he has used the media for many years and has very much perfect his technique. 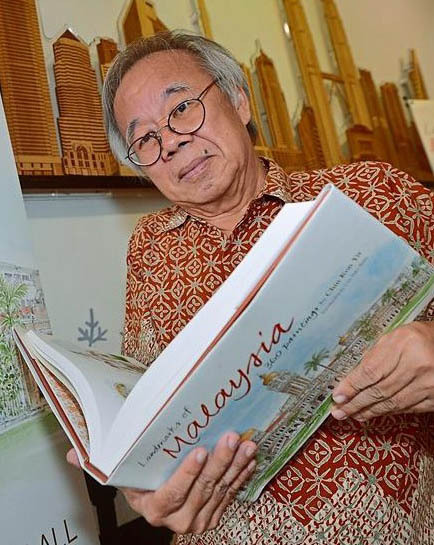 One of his most notable success as an artist is perhaps seen in the Sketchbook series where he has depicted his perception of the few major cities of Malaysia which have been permanently etched into the books. As it is know, Kon Yit’s work are easily recognizable because he uses his colours so well that they attract the viewing eye so effortlessly. He started off in the art scene when he was an active cartoonist in 3 of the major Chinese newspapers in Malaysia form 1969 to 1985 and then he was very much a graphic designer throughout his early career. In 1980, he ventured onto a painting trip to Thailand, Hong Kong, Taiwan and Japan where he then designed the Malaysian Watercolor Society’s Logo in 1983 and 1993. In 1988, he was appointed to design the Asian Watercolor Confederation’s Logo. Among some of his notable exhibitions include his 12th Solo Exhibition entitled “Postcard Stories” at The Art Room of G Hotel in Penang. He is also the recipient of the 2009 Asia-Pacific Prominent Cultural Person Honourable Award in 2010.